The second annual UnitedHealthcare IRONKIDS(R) Chattanooga Fun Run raced around Ross’s Landing today. 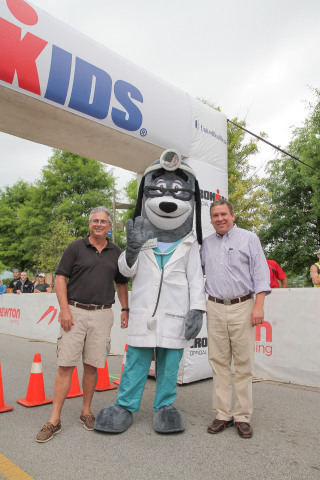 UnitedHealthcare mascot Dr. Health E. Hound kicked-off the fun run, joined by Rick Reeves, COO of UnitedHealthcare Community Plan of Tennessee, and TN House Majority Leader Gerald McCormick. TN COO for UnitedHealthcare Community Plan of Tennessee, Dr. Health E. Hound and TN House Majority Leader Gerald McCormick prepare to hand out medals to more than 200 local youth as they cross the finish line during the UnitedHealthcare IRONKIDS Chattanooga Fun Run at Ross’s Landing. Source: Steven Llorca. Local athletes, ages 3-15, had the opportunity to run on the same course as the IRONMAN(R) 70.3(R) Chattanooga, which takes place tomorrow. IRONMAN(R) pro-athletes Nina Kraft and Terenzo Bozzone were also on hand with Dr. Health E. Hound to help warm up the kids, and place medals on them as they crossed the finish line. This is the fourth year UnitedHealthcare is supporting IRONKIDS as part of the company’s commitment to help stem the rising tide of childhood obesity through healthy lifestyles. The UnitedHealthcare IRONKIDS 2015 Series features nine one-mile fun-runs and a dip-and-dash.